Cha-Ching! – Congrats! You have just referred a new Apprentice! 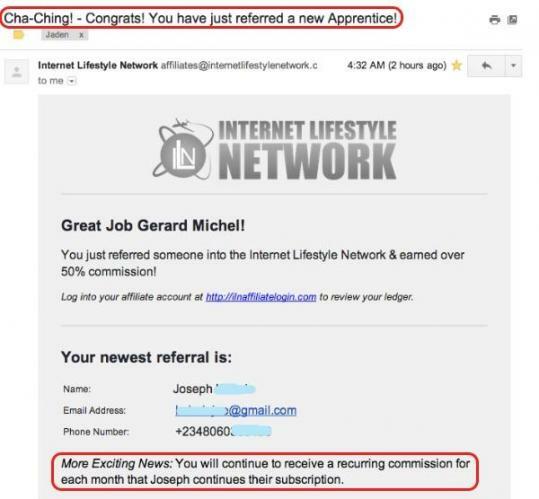 The Internet Lifestyle Network leaders say that their members love to receive these emails titled“Cha-Ching! – Congrats! You have just referred a new Apprentice!”. I understand why now… because I just received my first one. I can say that ILN is the easiest online money making program I have joined. Their system, funnels and training are great and their community is fantastic. The cost to get started is also very affordable. 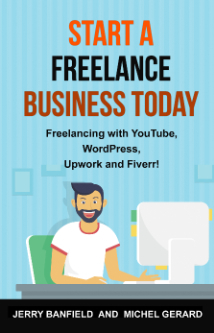 They claim that you can get your first sale within 24 hours and I believe them. I haven’t succeeded myself in this time frame because just after signing-up on 18th March, I did not start promoting immediately and went on holiday. I then took time to watch the training videos. Yesterday, I wrote a blog post about the Internet Lifestyle Network blog while I was setting it up. A few hours later I got my first lead through the blog and this morning the person has joined. I didn’t send the prospect any email or made any phone call. The person received the company’s auto-responder’s messages as soon as he opted-in from the blog. Not only 1 lead that becomes a sale is 100% conversion, but setting the blog yesterday and having the sale this morning looks like pretty much 24 hours to me! Getting your first sale with the Internet Lifestyle Network is totally doable within 24 hours you have started promoting. Be warned though that there is no guarantee you will make any sales during that period of time or ever, but if you apply their fabulous training and take action you are likely to win. Brand yourself, not the company!